What could be better than Google? How about a faster Google (GOOG). The search giant announced today a new enhancement called Google Instant that's designed to shave two to five seconds off a search query. Google sees the ability to provide speedier results as an edge against the competition, especially archrival Microsoft's (MSFT) Bing. Google Instant takes a predictive approach to search queries, spitting out potential results as a user types letters into the search bar. In a demo, typing the letter "w," for example, displays "weather" and other weather-related results right off the bat. The user also gets a list of other likely "w" results and can scroll down this list to pick the right one. "We want search to be fast, fun and interactive," said Marissa Mayer, vice president of Google search (pictured), during a press conference in San Francisco. Google says a search typically takes roughly 25 seconds, with nine seconds to initiate the search and another 15 to find the right result. Google Instant promises to shave seconds off that process. "Never underestimate speed," Mayer quipped. 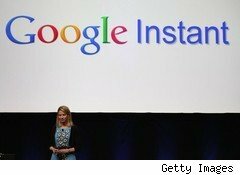 Google Instant is launching today on Google Chrome, Firefox, Internet Explorer 8 and Safari browsers, and within the week, it should be available in the U.S., Germany, Spain, Italy, Russia, the U.K. and France. In the coming months, the search giant plans to make Google Instant available to Japan and also mobile devices. Users who find the predictive results annoying can turn off the feature. And Mayer acknowledged that was the case for some during the testing phase. Despite the added speed to Google searches, it doesn't necessarily mean it will translate into faster revenue growth for the company, said one industry expert. "I don't know if it will drive more advertising revenue, just because users can do searches more quickly," says Danny Sullivan, editor-in-chief of Search Engine Land. He adds, however, he finds the feature is "pretty cool," and it will serve the purpose of showing users that Google is still on an innovation path that may help keep users from defecting to Bing. Johanna Wright, director of Google product management, said during a question-and-answer session (pictured at left) after the presentation that search engine optimization rankings shouldn't change as a result of the new feature, but the way people conduct their queries may change over time. Google co-founder Sergey Brin remains optimistic that investors will benefit down the line. "Fundamentally, we expect that this feature will have more user adoption, and hopefully that will pay off for investors," Brin said at the launch event. According to Google, if all searches done globally use Google Instant, it would save humankind 3.5 billion seconds a day.